How can I blog about GREY without a word on BRUNELLESCHI? Having last posted about the gorgeousness of grey, I find myself teaching Renaissance architecture and, thrillingly, introducing my students to the equally gorgeous architecture of Brunelleschi. 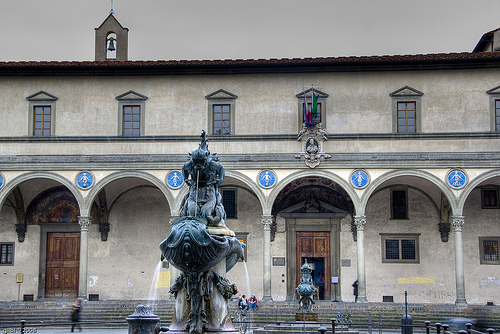 The Ospedale is a foundling hospital built in the early 15C by Florentines who were most proud of their provision for orphans. The facade of the building comprises a colonnade atop a gracious flight of steps. The colonnade is constructed with slim Corinthian columns and wide semi-circular arches, creating a stunningly elegant loggia in which to shade from the Tuscan sun. And what colour did Brunelleschi choose to enhance the symphonic lines of this construction? Brunelleschi used pale grey stone and white stucco as the colour theme for his creations – Oh, the elegant simplicity of this combination. In Florence this beautiful grey stone is known as Pietra Serena, ‘Serene Stone’. And isn’t it just? The grey/white combination says: admire my restrained beauty … these are serious spaces but they are delicate … this architecture is dedicated to the divine in proportion and intention … this building is the reflection of God in man. 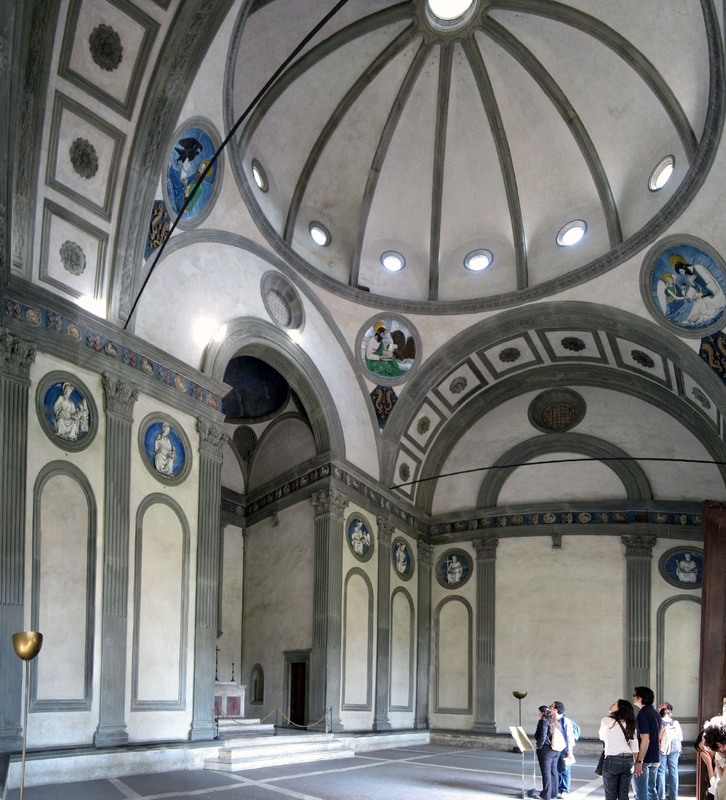 From the Ospedale my family would proceed to the Pazzi chapel, perhaps Brunelleschi’s greatest masterpiece and, without doubt, a jewel in the crown of Renaissance architecture. Here again the interior is intoned with grey and white, creating a space that appears to float on a divine cloud. The genius that is Brunelleschi was also responsible for the most recognisable sight in Florence, namely the dome of the Basilica di Santa Maria del Fiore. There is no doubt that this Herculean feat of engineering is majestic in both its construction and aesthetics: but it was not this bold statement that my father exhorted us to admire. The use of grey and white to accent and enhance the sublime proportions and lines of the architecture goes far beyond ornament. These very specific colours are a vital part of Brunelleschi’s message. No other colour combination would have worked. It had to be Grey. Grey is soft and furry and sleek and sophisticated and depressing and sturdy and cool and warm and boring and reliable and tranquil. And now we can add serene. The Serenity of Grey – the final touch to some of the most breathtakingly beautiful architecture the world has ever produced. Next Post So you’re a bit of a painter are you? Great post. How fantastic to be introduced to a building like this one when you’re young. 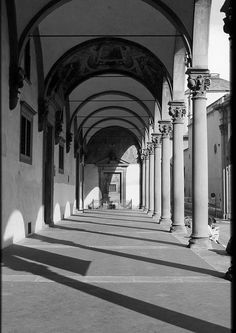 I used to love sitting in the square here because it always felt so tranquil, even in the middle of a busy Florentine summer. It always amazed me. I think there’s something about the arches and the grey colour – in feng shui that’s the Metal element, the energy of order. And what serenity there is in order! Another illuminating post from Silver Painted River. Who knew there was so much to say and see about grey? Lovely. There is of course one exception: grey men’s lace-up shoes. Ick. Ah, Order! No wonder I love it so much. Yes, you’re right, there is always such a feeling of calm in that square. Thank you. Grey is just so lovely!! Oh, Yes! You are so right! Grey lace-up shoes – so enervating and completely off-putting! And very often plastic. Yuck. months your blogs make me think and look again my little world . I can think of many buildings around the world where as we enter are enveloped by its hugeness , which holds us in like a grey shawl. Yet isn’t there just a whisper of blue your building Francesca ? Thank you, Lucy – what a wonderful comment. This is the thing about Grey, it is so many opposites – and warm and cool is one of them. You are right, stone is not lifeless. My previous post was about the fact that these classical sculptures would have been highly coloured, and I wondered if, firstly The Renaissance, and now us would value them quite to this extent were they to be in ‘full make-up’. How wonderful to have the memory of this beautiful building linked in with your father. It is absolutely gorgeous!